I was named Tara because my maternal grandmother was born in Co. Meath, not far from the Hill of Tara. So you can imagine that this sheela is a sentimental favorite. 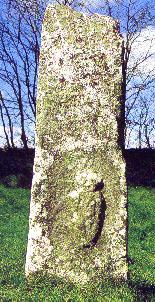 It is on St. Adamnan's pillar and is VERY old and weathered. The figure looks almost like an alien, and I could barely discern the faintest trace of a mysterious smile. This sheela is standing, and has pointy ears, or pointy hair, or a hat with points, or some kind of antlers. Anderson describes the sheela as "pre-Christian" and Roberts and McMahon describe her as "possibly the earliest sheela-na-gig". See Bibliography for more information on these references.